Now I know I just said in my last post that I was going to be focusing on healthy eating, less baking and reducing my white flour and sugar this year and I assure you I haven't failed already! My standard pancake recipe is something I have been meaning to blog for years, we do after all have them once a week and have done so for a few years now. I even based the Carrot Cake Pancake recipe on this one and still didn't manage to blog it! 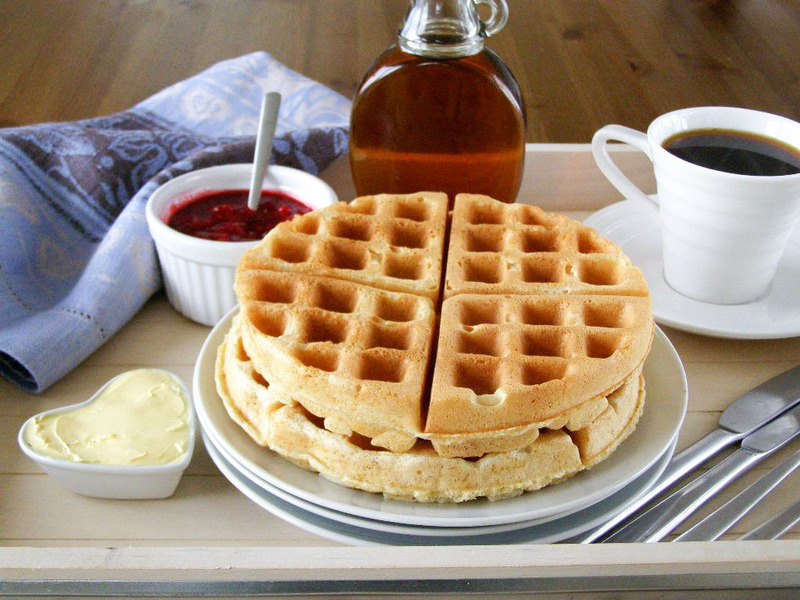 Pancakes or Waffles - makes 5 seven inch round waffles or 10 medium / 15 small pancakes. Whisk the dry ingredients together. In a pyrex measuring jug mix together the milk, vanilla and oil give it a mix with a fork then pour over the dry ingredients. Now pour the sparkling water over and whisk the whole lot together gently until it all just comes together in a batter. Do not overmix or whisk until it is super smooth, little lumps are ok, over mixing will give you tough rubbery pancakes or waffles. I also like to add the sparkling water last like that so it first reacts with the flour and fizzes up, if you add it to the wet ingredients first I find it already loses some of it's fizz action. For waffles simply use as per your waffle maker's instructions. For pancakes I lightly grease non-stick pans and preheat, when hot pour on the batter, I like smaller pancakes and use a 1/3 cup scoop. 1/2 cup scoop will give you slightly bigger pancakes. When they start to bubble on top have a little peek underneath that they are golden brown then flip over. I usually turn the hob down to minumim when I flip to ensure these cook thoroughly, as they are quite thick you do have the risk of golden brown pancakes on both sides but with a raw, doughy centre - not good! These also freeze beautifully, for waffles just let them cool completely, separate into 4 wedges then place in freezer bags as you can toast them straight from the freezer for yummy instant vegan waffles! Just slather them with your vegan butter of choice and fill those little pockets with lots of maple syrup! 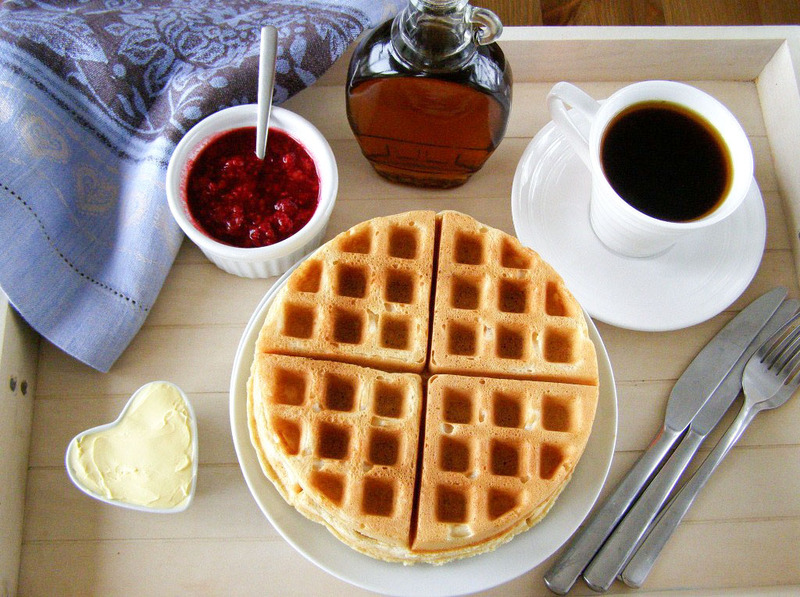 We also like to have the pancakes with some raspberry jam, and have had the waffles with some raspberry compote that you see in the picture there, just some defrosted frozen raspberries mixed with some caster sugar - it makes it's own sauce, easy! ooh, thanks for posting this. I finally mastered pancakes on New Years day but I gave my waffle maker away a few months ago cos I could never get them to work. 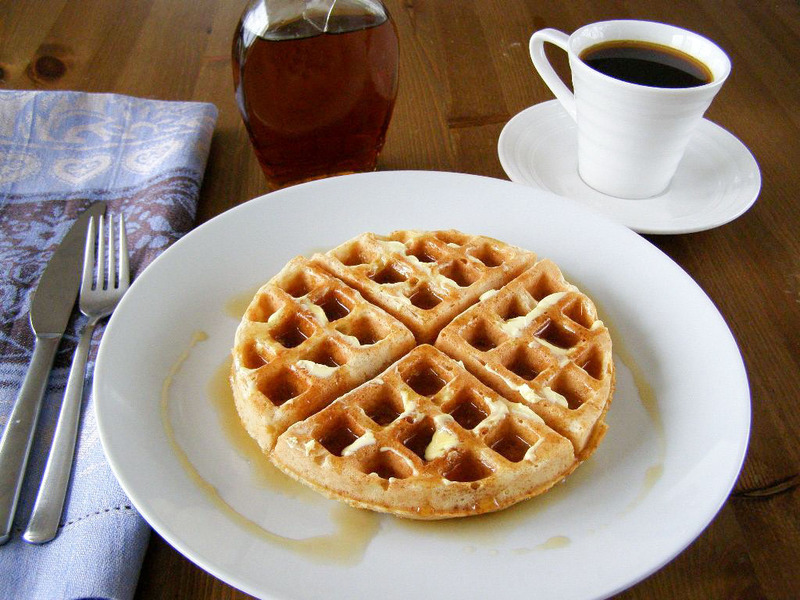 It was a different type of machine with much thinner waffles. I may have to look out for a machine like yours and give them another go! Thank you for a pancake post, it's just what I have been looking for. I have been wanting pancakes for months now. Whoa, they look so fluffy!! Could almost stroke instead of eat. Almost. Just made the pancakes, they are amazing! So fluffy!! Easily the best vegan pancake recipe I have come across, thanks so much for sharing with us. Yippee, this came up on page 1 of my google search! Will be all over this on Tuesday! They look absolutely delicious, Deb! 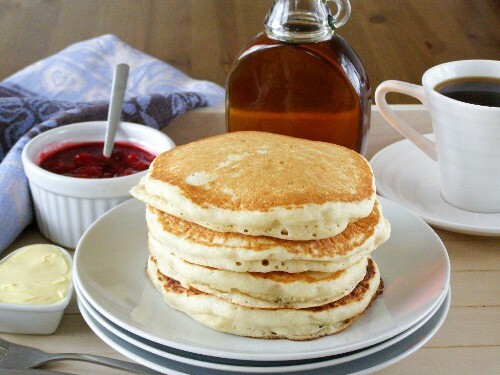 I'm definitely in the mood for pancakes now! I haven't tried these yet, but do you think you could use the sparkling water as the only liquid, instead of with the milk and still get about the same result? Hi! My gut feeling is they would come out rather flat as you need the protein in the milk. 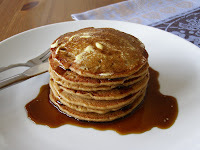 When I use soy milk which is fairly high in protein they come out really fluffy (as in the picture) and when I use rice milk which is lower in protein they are less fluffy, so I think using just water would result in quite flat pancakes.... Just an assumption though so it's still worth a try! I randomly typed in "blueberry vegan pancakes," printed this out and begged my boyfriend to make them. They were wonderful! Thank you for posting this! Ah, that's great!! So glad you guys like them, they are a standard in our house for sure :-) Thanks so much for the comment!